A light coloured ox with magnifient spreading horns of a type known as wer. This image was probably taken among the Eastern Jikany Nuer by F. D. Corfield, District Comissioner at Nasir on the Sobat River in Upper Nile Province during Evans-Pritchard's fieldwork. Morton, Chris. 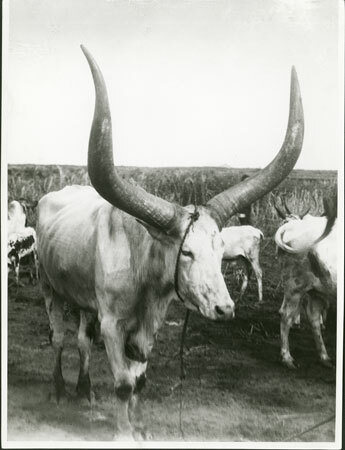 "Nuer ox with spreading horns" Southern Sudan Project (in development). 03 Jan. 2006. Pitt Rivers Museum. <http://southernsudan.prm.ox.ac.uk/details/1998.346.368/>.